Baldwin's builder photograph of a brand new #8. Photograph courtesy of Jerry Lamper. The #8 is seen here early in its McCloud career, posed with a log train on the curved trestle at the base of Bartle Hill, about two miles east of Bartle. 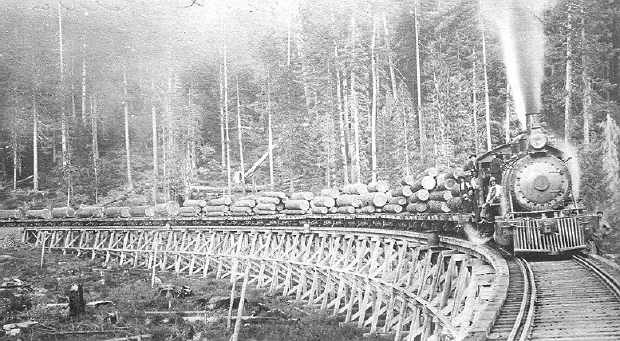 This trestle was a popular place to photograph the McCloud in action in the early years; this trestle was eventually replaced by a fill. 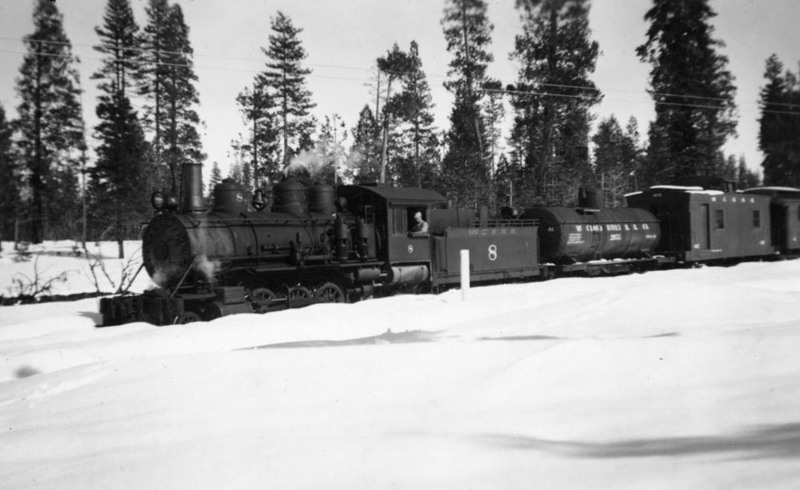 The #8 is seen here with a couple of company cars in the snow. Jeff Moore collection. The #8 with a trainload of logs early in its career. Photo is from the collection of Dennis Sullivan. Photographer and date unknown. However, this picture was taken in front of the Amador Central Railroad's engine house at Martell, CA. The #8 has not yet been re-lettered or re-numbered for its new owner. Another photo of McCloud River #8 in service as Amador Central #7, from Western Railroader #527. From the Glen Comstock collection. McCloud River #8 on display as Amador Central #7, the "Iron Ivan" in Ione, California.